Hope you were not planning a visit. That’s our guest bedroom. As I mentioned in my prior post, painting a room in this home is a chore. Truth be told, it wouldn’t have to be. We could just slap some paint on the walls and call it a day. But that’s not our style. We don’t plan to move away from this home (we hate moving! ), so we are not looking for any quick fixes or fast changes. Each room has had a set of challenges, making them all pretty involved projects. This room’s particular challenges came in the form of heart wallpaper. I’m happy to say it’s all gone (hallelujah!). 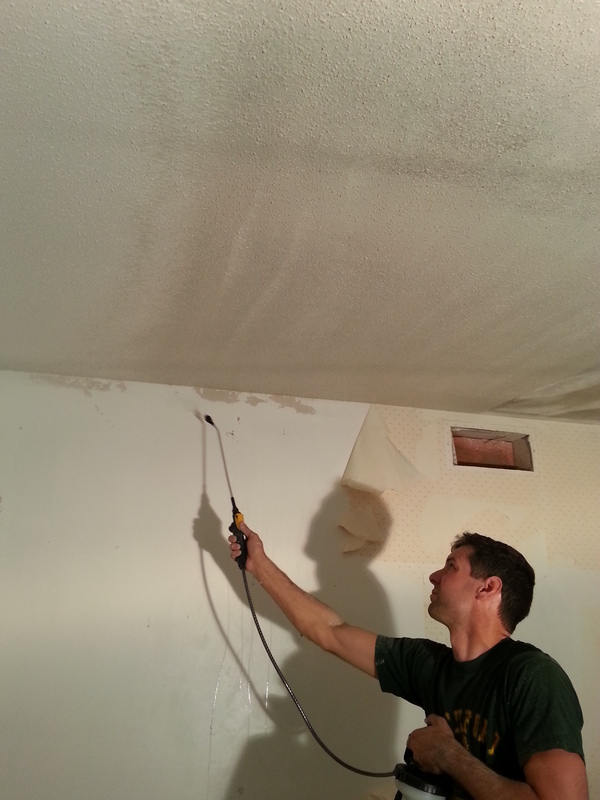 While I was finishing the last wall, Nathan tackled the popcorn ceiling. It’s not our first rodeo, so to speak, so it went pretty quick. 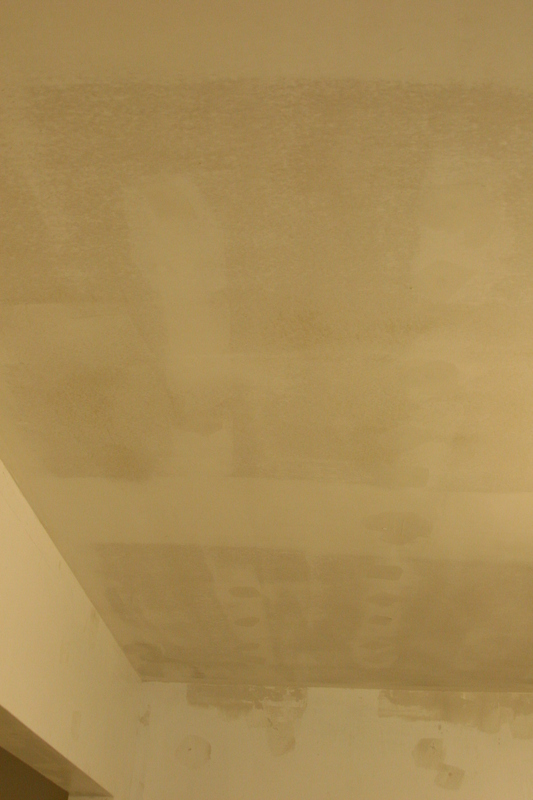 We’ve had several people ask us over the years how we remove the popcorn ceiling, so I’ll go ahead and share with you how we do it…as boring as it may be…. 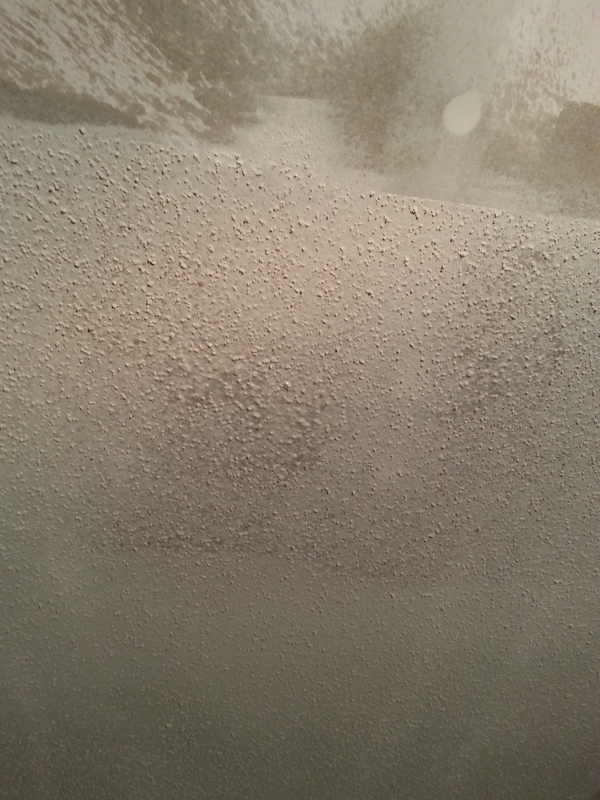 Here’s the deal with our popcorn ceiling. It pretty much makes my skin crawl. 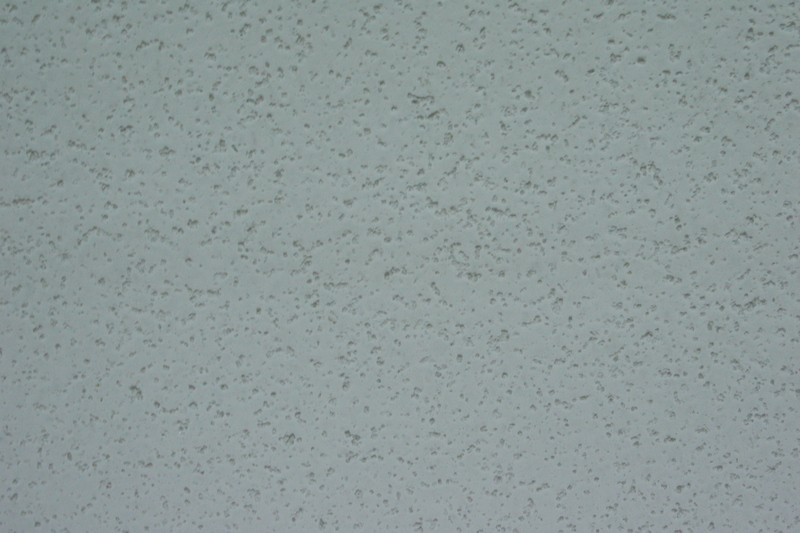 Not all popcorn ceiling does this to me…but I know these particular ceilings, and they are gross! 26 years of dust, grime and discoloration ain’t pretty! These ceilings have never been painted (which we are actually glad for…I’ll explain more later), but I am totally grossed out by them nonetheless. Taking them down in this room was a piece of cake. First, we take care of electrical and we take out existing lighting, so we don’t cause any damage (or fires). We use this cheap halogen work light, which heats up so much it makes us feel like we are working on the surface of the sun. Take it from us, spend the extra money and buy an LED or some other type that does not feel like an extra heater. 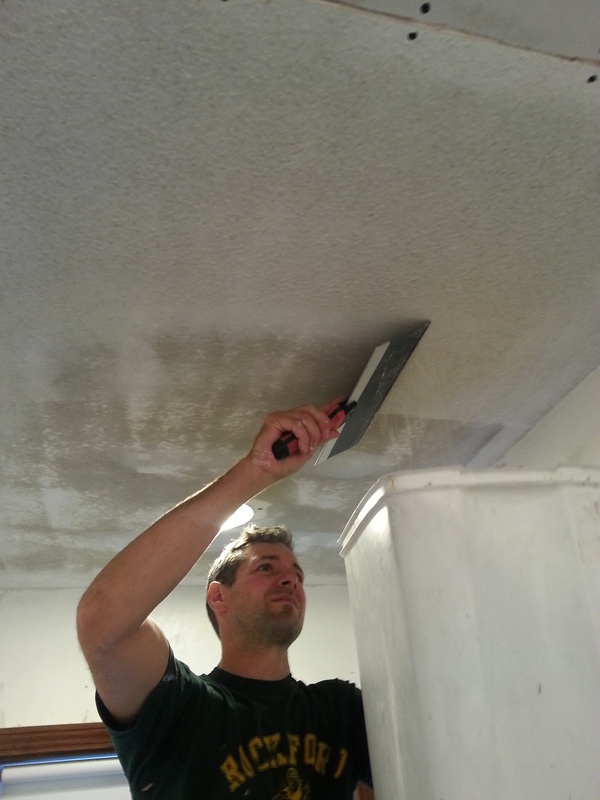 Using a basic garden sprayer like this one, Nathan sprays a section of the ceiling with plain old water. Be patient a minute or two, and let the popcorn become saturated. 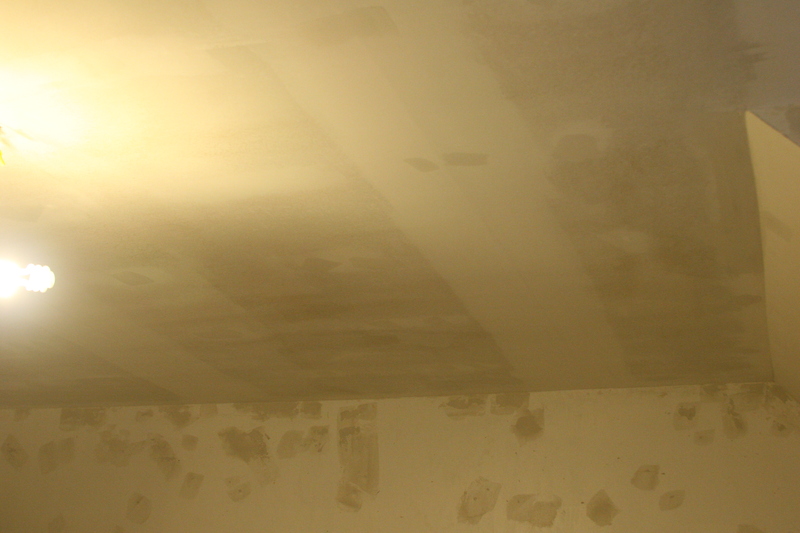 Once you can see it’s saturated (minute or so), gently scrape along the ceiling with this handy dandy drywall tool. 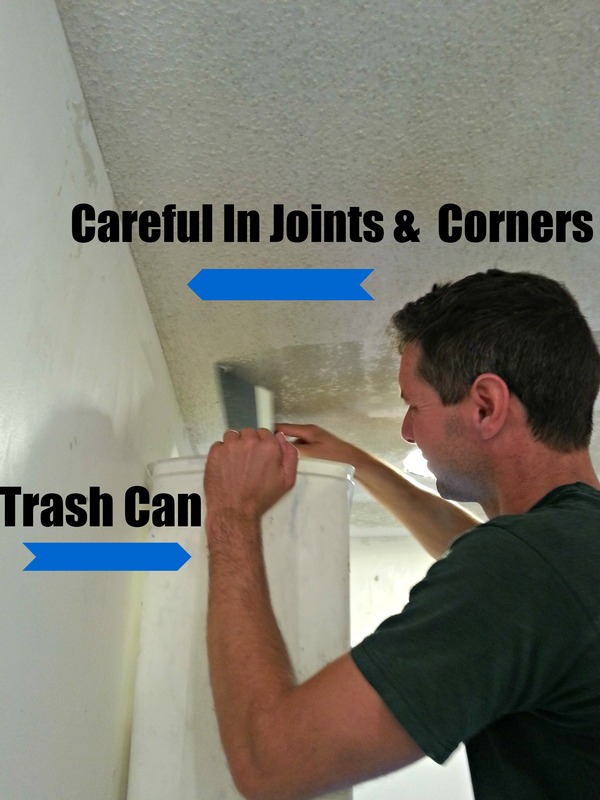 You have to be careful though, if you get the ceiling too wet, or you get aggressive, you can actually start removing much-needed joint compound in seams, etc. Once the ceiling is scraped you move on to a new area. Bam. Done. ::put down plastic drop cloths. No matter how much you *try* not to make a mess, you’ll make a mess. :: consider taping off any heating/cooling ducts with plastic and painters tape so you keep your mess more contained to the room you are working in and don’t spread it throughout the home via your ductwork. You’ll notice we don’t have ours all taped off, but our air conditioner has not been on, since it’s been so nice outside. Once we start sanding we will make sure the ductwork is covered. :: we use an old trash can under where we are scraping to “catch” as much of the popcorn as we can, and move it along with us as we go. :: As we have already mentioned, don’ be aggressive with your scraping, use special care around seams, corners, etc, that you don’t scrape off too much extra compound. Make sure things are damp, be patient, and then scrape popcorn only. :: all popcorn is created differently. Sometimes it’s been painted, or it’s a different texture. It could be that the drywall is barely finished under the popcorn. Experiment with yours in a closet or small pantry before you tackle a big room, to see what you are up against. If it’s been painted, it may be significantly more difficult to remove, depending on how well it has stuck and what type of paint was used. :: consider the age of your home. I have no idea, but anytime you are scraping paint or things of that nature, there’s always a chance you are dealing with lead paint. Our home was built 8 years after lead paint was banned, and are not painted at all, so we were not concerned. I don’t think popcorn was really used until the ’80s, long after the death of abestos and lead paint…but sometimes was used in older homes to cover up failing plaster ceilings….so always keep that in mind when working on older homes. Once we scrape our ceilings back down to drywall they actually look pretty good. We’ve found they need some, but not much more work, and we are ready to paint. Keep in mind, we only know from experience in this home. It’s not been impossible, but it’s been a mess. 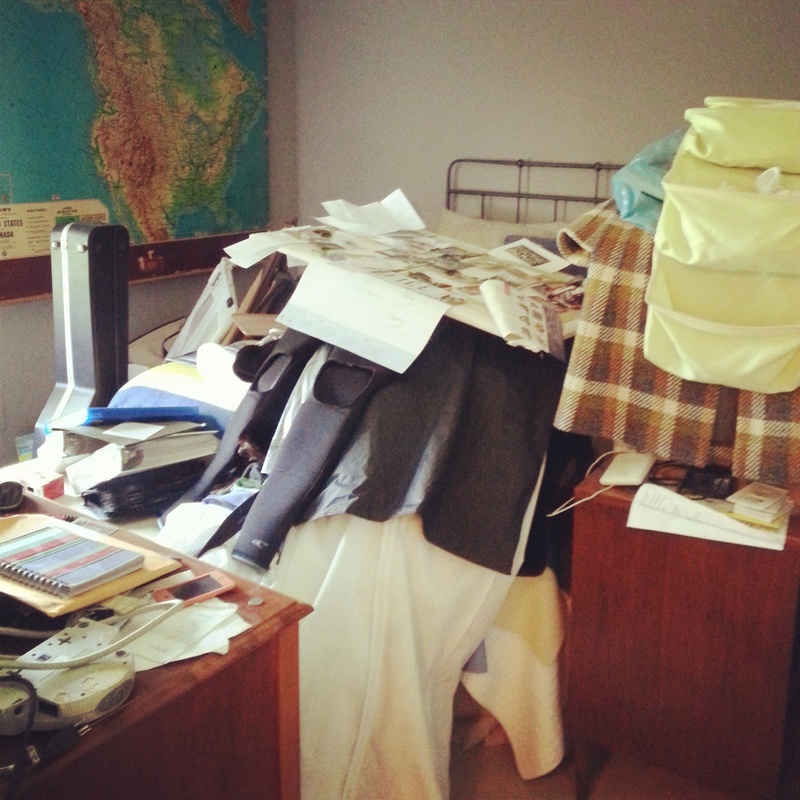 That’s why I really suggest that you start in a small, less noticeable room. So, while results can vary, it’s so worth the effort. It is a major game changer to a room, and I can’t wait to show you the outcome! With the removal of the popcorn in the “heart” room, we are 1 bedroom, 1 bathroom, and 2 closets from eradicating popcorn from our humble abode. Not that I’m counting or anything. 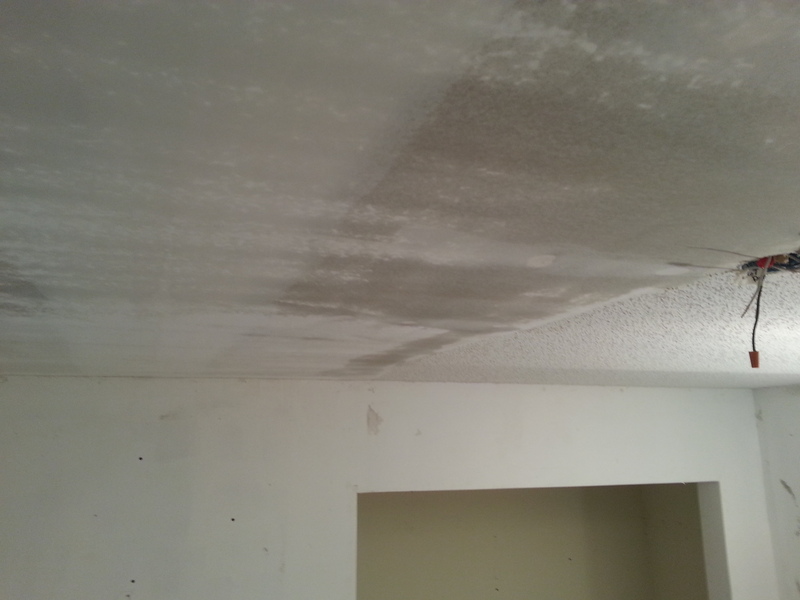 Have you ever removed popcorn ceilings? What was your experience? You make it look so easy!! 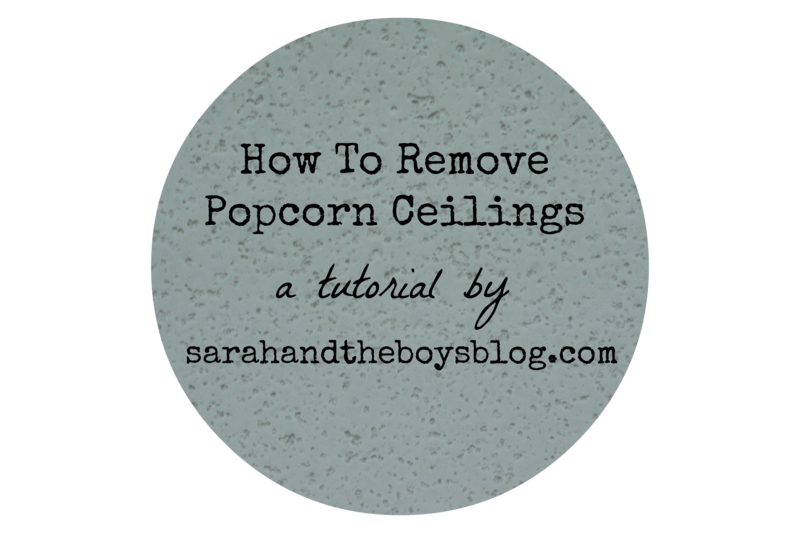 I have never tried this, but I kind of want to find someone’s popcorn just to see if it’s as easy as you make it look:) We have some kind of wavy textured ceiling–but our apartment of 6 months had a design that resembled either dead butterflies or lungs–we couldn’t quite decide. Amy, our first time wasn’t as easy–lots of trial and error. But we’ve gotten better at it, that’s why I’m sharing, in case I can help someone else a little bit. Be really glad you don’t have it in your home!! !